dominate the southwestern aspect. 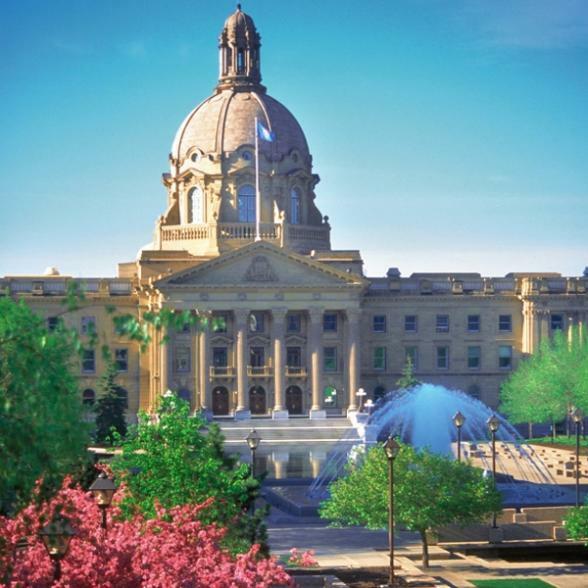 Alberta is characterised by numerous ranches and livestock farms as well as the two modern cities of Calgary and Edmonton, the capital. 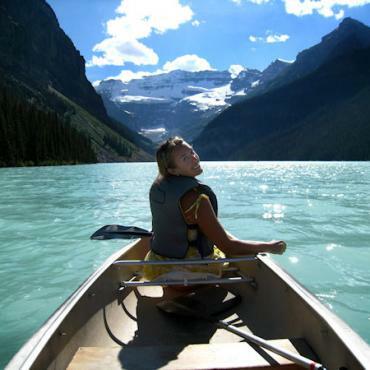 Alberta is also home to some of the most beautiful national parks in the country, Jasper and Banff to the west, Waterton Lakes on its southern edge and Wood Buffalo to the north. 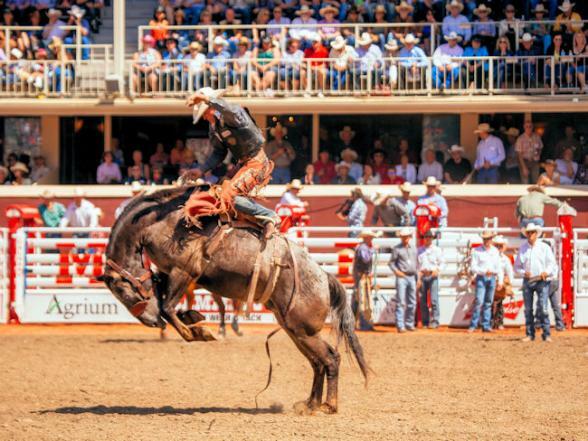 Calgary, is located in the south of the province, in an area of foothills and prairies. It’s cattle rearing heritage gave the city the nickname of ‘Cow Town’. In 1988, Calgary became the first Canadian city to host the Winter Olympic Games which has left behind such legacies as the Canada Olympic Park and the Olympic Plaza. 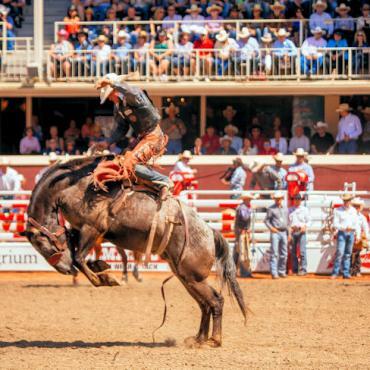 Also known as ‘The Stampede City’ after the Calgary Stampede, this annual rodeo, exhibition and festival is held every July and modestly bills itself ‘The Greatest Outdoor Show on Earth’. Edmonton, Canada’s fifth largest city is located in the centre of the province and its biggest claim to fame is the West Edmonton Mall, the largest shopping mall in North America . A large water park, an amusement park, a gigantic ice rink, hundreds of stores and restaurants await the visitor. If this is the zenith of man’s ingenuity then Mother Nature hits back; in the right conditions Edmonton will offer up the unforgettable experience of viewing the aurora borealis, the Northern Lights. Alberta wows us with the long and beautiful route from Jasper to Banff, through the heart of the Rockies. The little town of Jasper grew thanks to the arrival of the railway. Marvel at the feat of engineering which brought the railroad through the Rocky Mountains over a century ago. By taking the road leading southwards you will arrive in the Whistlers Mountain area which is best appreciated with a ride on the Jasper Skytram, a spectacular, guided aerial tram ride. The 7-minute flight takes you to touchdown at an elevation of 7,500 feet and from where villages, mountains, valleys, and rivers open up before you. From the road which leaves Jasper to the north, you’ll discover Maligne Canyon, the most spectacular canyon of the Canadian Rockies at 50 metres deep in places but only three metres wide. Serious hikers come from all parts of the world to trek through the canyon and are rewarded with spectacular waterfall views. Heading south towards Banff you are driving the famous ‘Icefields Parkway.’ Superb landscapes and unforgettable views await as the Parkway runs parallel to the Continental Divide . There are many viewing points along its length of 145 miles and look out for deer, mountain goats and bears crossing the road. The many glaciers are the source for numerous lakes along the route. One of the most iconic is Peyto Lake in Banff National Park, perhaps the greenest of all the lakes of the Canadian Rockies. About 20 miles south of Jasper are Athabasca Falls. These falls pour into a canyon whose walls have been polished by the force of the water. The Athabasca Glacier at the foot of Mount Columbia is the highest summit in Alberta. Discovered in 1898, it is the most important in the southern Arctic Circle and is in a state constant movement. Entering Banff National Park one arrives at Lake Louise one of the gems of the Canadian Rockies. The colour of the water is breathtaking; seeming to be almost painted, so deep blue is the water. 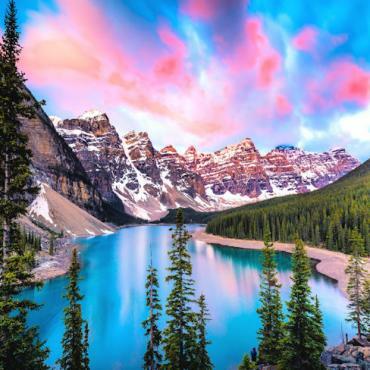 Nearby Moraine Lake which is featured on the Canadian $20 bill is wilder than its neighbour, with surrounding forests which seem to throw themselves into the water. On the far side is the rock fall originating from the Tower of Babel, a quartzite spire rising 1,500 feet above the lake. The town of Banff on the southern edge of the park is an alpine settlement literally bubbling from its two hot springs. Besides the many interesting trails Banff is home to the Cave and Basin National Historic Site, Upper Hot Springs and Sulphur Mountain Gondola ride. A beautiful walk to the Banff Springs Hotel, an historic building and one of the original ‘railway’ hotels of Canada, will allow you to admire Bow Falls. 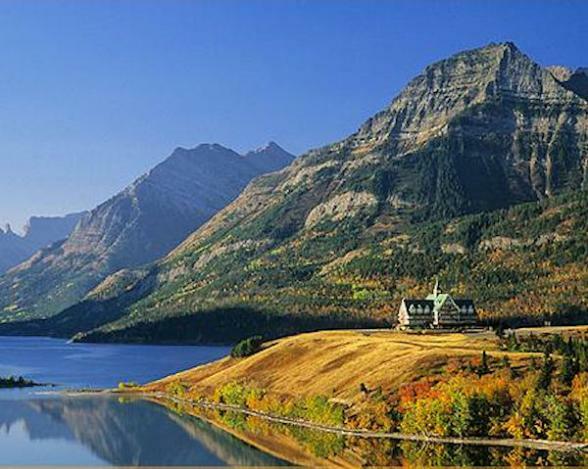 Waterton Lakes National Park in the southern part of the province continues into the U.S. State of Montana as Glacier National Park. The lack of transition between the plain and the high peaks is astounding and brings to mind the same dramatic contrast seen in the Grand Teton National Park to the south of Yellowstone in Wyoming. One of the characteristics here is the richness of the ecosystem and its wildlife. It is not rare to come across a mountain goat on the steep slopes or to see a mountain lion (puma) or even a bear. For a limited period we've got some maps of Western Canada that we'd love to share with you. Please email us your address and we'll pop one in the post today. 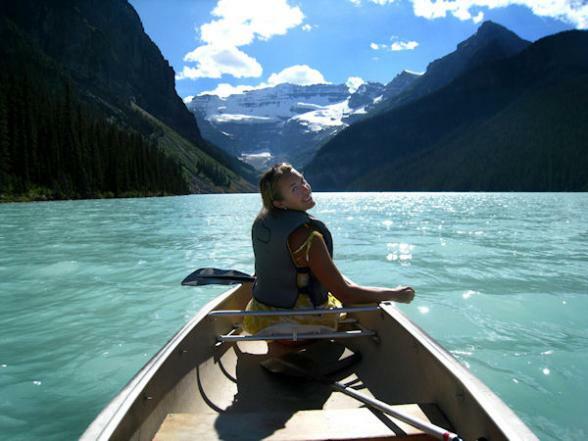 We will also sign you up to receive our FREE ideas and inspiration on holidays to Western Canada with Bon Voyage. In the meantime, for holiday suggestions please check out our itineraries. All Bon Voyage trips are tailor made, and we would love to discuss your plans with you. Simply call the team of experts at Bon Voyage on (0800) 316 3012 and we'll take care of the rest. Welcome to Western Canada. 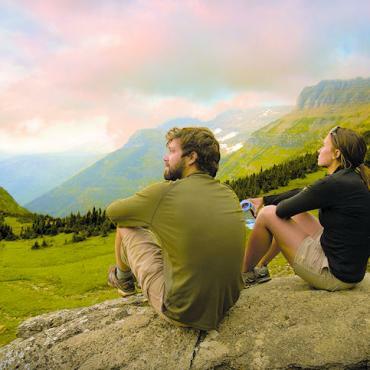 Simply one of the best places in North America to explore the great outdoors and nature's wonders. 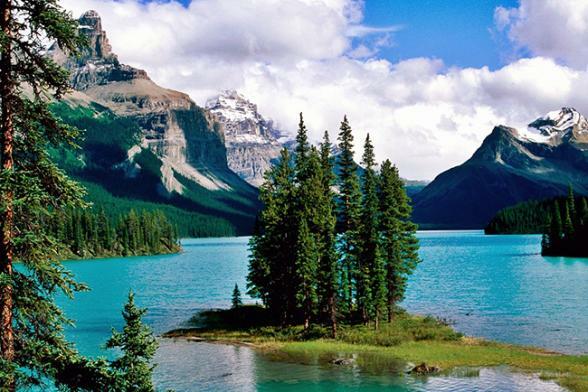 Cosmopolitan Vancouver is the starting point for this 18-day circular tour that showcases the national parks and lakes of the spectacular Canadian Rockies. 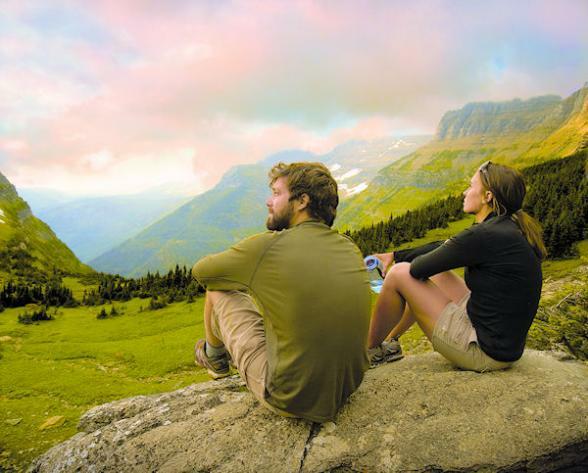 Enjoy homely Bed and Breakfast accommodation as you explore beautiful British Columbia and its stunning national parks.. The glaciers, national parks and laid-back cities of western Canada are just some of the highlights on this adventure into places like Vancouver, Victoria, Whistler, Jasper and Banff. 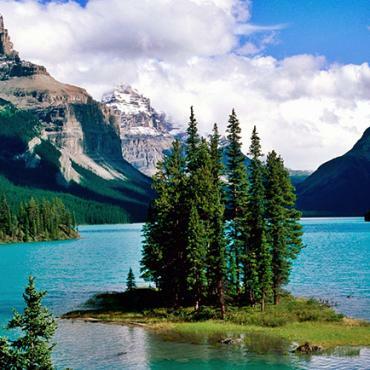 The glaciers, national parks and laid-back cities of western Canada are just some of the highlights in Calgary, Lake Louise, Whistler, Jasper and Banff. Grizzly bears, spectacular rock formations, thunderous waterfalls and the tranquil emerald waters of glacial lakes – take in the best of the Rocky Mountains on this in-depth exploration. Experience the Best of the West on this magnificent journey through the worlds most photographed landmarks-the National Parks of the Canadian Rockies. 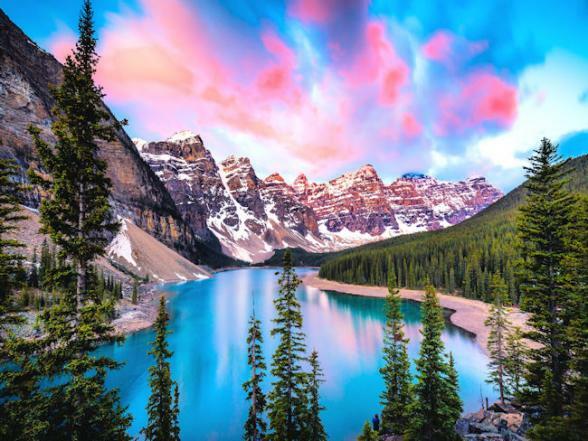 This escorted tour will take you through Canada's icon natural landmarks from Calgary, the gateway to the Rockies to Banff, Lake Louise, Jasper National Park and Montana’s Glacier National Park. This escorted Canadian Rockies holiday will take you through Vancouver, Victoria, Banff and Calgary, taking in the magnificent Canadian Rockies and National Parks. Experience the Canadian Rockies with a spectacular backdrop of jewelled lakes, frosted peaks, emerald forests, glacial ice and wilderness castles. On this leisurely fly-drive through British Columbia's awe-inspiring Rocky Mountain region you'll explore four of the province's seven national parks, encounter endless wildlife and experience a wealth of outdoor pursuits. This holiday explores the mountains, forests and waters that make the provinces of British Columbia and Alberta a world-renowned place of natural beauty. 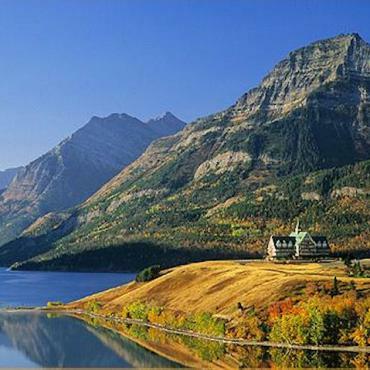 A charming and historic lodge, just a 5 minute walk to stunning Lake Louise. An oasis of calm and tranquility in Banff National Park. This lodge has beautifully appointed rooms and cabins with spectacular views of the Moraine Lake or Valley of The Tea Peaks. Set in Banff National Park and dating back to 1922, this Lodge has 16 historic cabins in the grounds all with cosy wood-burning fireplaces. Here you'll feel at one with nature! Legendary, luxurious property perched on the edge of one of the world's most photographed lakes, Lake Louise, 30 minute drive from Banff. Nestled 7,000ft high in the Canadian Rockies, the Sunshine Mountain Lodge delivers extraordinary luxury surrounded by breathtaking scenery, just 15 minutes' drive from Banff. This award-winning wellness resort and mountain retreat lies near the pretty town of Canmore, and just a 20 minute drive to Banff. This historic, boutique hotel in Lake Louise Village upholds the standards of Relais & Chateaux: charm, courtesy, cuisine, character and calm. Located a scenic 30 mile drive from the town of Jasper, this true mountain resort offers sensational views and fine dining. Choose to stay in the lodge, chalets or the cosy cabins. Fab, fun, funky and situated in the heart of downtown Calgary. Set in a trendy neighbourhood of Calgary, this boutique Relais & Chateau property oozes intimate ambience, elegant rooms and gracious service. This historic landmark hotel, located in the heart of Calgary, offers a classic style, excellent service and a luxury accommodation options. An iconic lakeside resort complex set on wooded grounds around Lac Beauvert, 4 miles from Jasper town centre.